Viewed from an aerial perspective, a dark-haired woman sporting a pink flamingo-flecked blouse smiles broadly as she donates blood. 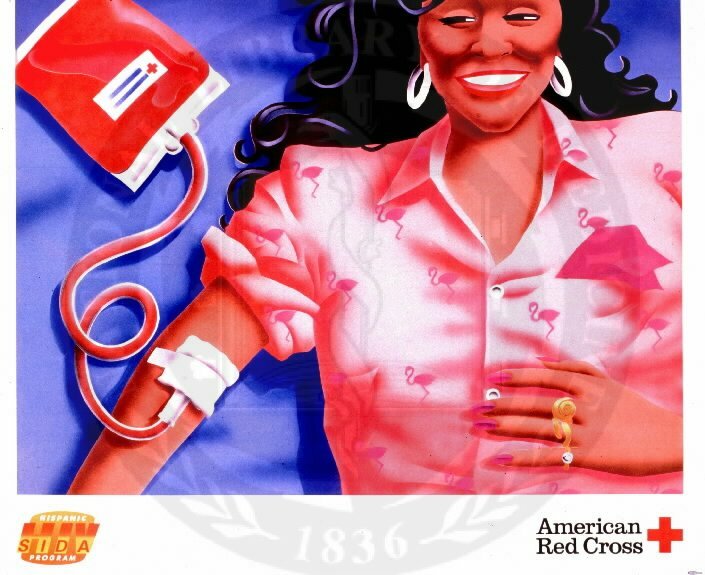 The poster entitled Woman donating blood is part of a series of educational materials created by the American Red Cross’s Hispanic HIV/AIDS Education Program (SIDA is the Spanish acronym). This Spanish-language program, developed by Hispanic health educators, aims to educate people about AIDS and its prevention, using a culturally-specific approach based on values, beliefs and concerns that are likely to be common to the diverse Hispanic population in the United States. The image, from NLM’s Prints and Photographs collection, likely dates from the late 1990s/early 2000s.